Raumfahrt - Traveling to Mars Will Wreak Havoc on Our Bodies – Can We Prevent It? Our galaxy is home to 100 billion stars — and soon there may be one more. Russia is slated to launch a reflective satellite into space later this summer that, in theory, will shine from the sky brighter than any other star. Called Mayak, which translates to “Beacon” or “Lighthouse” in English, the satellite is “roughly the size of a loaf of bread” and will launch on Friday, July 14 from the Baikonur Cosmodrome in Kazakhstan aboard a Soyuz-2 rocket. Once the small satellite is 370 miles into orbit, it will deploy a pyramid-shaped solar reflector that is designed to capture the sun’s rays and bounce them back to Earth, creating the effect of a twinkling star to Earthlings. The reflector will be 170 square feet, is reportedly 20 times thinner than human hair and is made of Mylar — a thin polymer material. One goal is for the satellite to outshine naturally existing stars. Another is to evaluate how to brake satellites in orbit and de-orbit them. The Russian team of engineers and space enthusiasts also hope to generate interest in space exploration. "We are sending a spacecraft into orbit that will be the brightest star in the sky, visible from any point on our planet," Alexander Shaenko, head of the Contemporary Cosmonautics program at Moscow State Mechanical Engineering University, told Sputnik News. "We want to show that space exploration is something exciting and interesting, but most importantly that today it is accessible to everybody who is interested." The journey, funded by a crowdsourced campaign on Russian crowdfunding site Boomstarter, will come with an accompanying app. This will let smartphone users track the progress of the satellite and provide an exact location at any given time. But not everyone in the astronomy community is on board with this project. Critics say it’ll be a distraction for stargazers and scientists attempting to study the night sky. If all goes to plan, the shiny new probe will help test methods for cleaning up space junk orbiting Earth. Soon, there may be a new human-made “star” gliding across the heavens that will be brighter than both the International Space Station and the planet Venus. Mayak, the Russian word for “beacon,” is a pyramid-shaped satellite that is the brainchild of a group of students at the Moscow State University of Mechanical Engineering (MSUME), who successfully crowdfunded the money to build and launch the probe. Their 3U CubeSat is part of a flotilla of 73 satellites hitching a ride aboard a Soyuz rocket scheduled to launch on June 14 from the Baikonur Cosmodrome in Kazakhstan. Once in orbit some 373 miles above Earth, the bread loaf-size satellite will attempt to deploy four triangular reflectors neatly folded inside a canister. Once unfurled, the resulting sail will extend about 170 square feet across. If the satellite manages to successfully inflate its metallic reflectors to full size, it has the potential to become the brightest human-made object in orbit. Some reports have even speculated that it could become the third brightest object in the entire sky, outshined by only the moon and the sun. The mission team’s hope is to test new aero-braking techniques that could one day be used to safely and cheaply de-orbit space junk. But they also want to help demonstrate that a team of motivated everyday people, not just governments and big companies, have the ability to launch a real satellite. 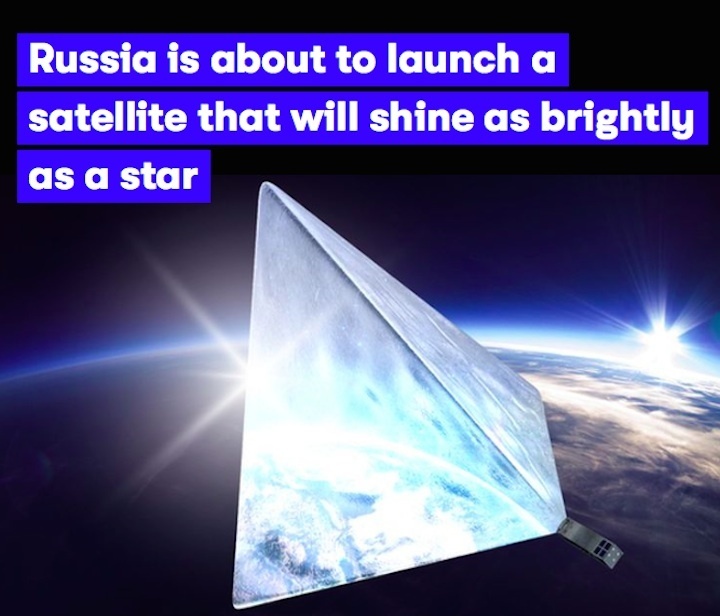 As with hundreds of other orbiting objects, sunlight will reflect off Mayak’s shiny surface, making it appear from the ground as a bright object gliding for a few minutes across the fixed backdrop of stars. The mission team has developed an app (in Russian only for now) so that the public can locate and track Mayak in the skies above. If it does successfully reach orbit, other online satellite tracking services will likely include it in their databases of Earth-orbiting spacecraft. To some sky-watchers, the prospect of a new uber-bright satellite zipping across the starry skies has raised concerns, including the worry that this project signifies the further loss of pristine dark skies. Still, if the Russian students pull off this project, even people under bright city skies will be able to look up and take notice of an eye-catching cosmic beacon. An artist's conception of Mayak in orbit. The hunt is on. A Soyuz-2.1a rocket roared to life at the historic Baikonur Cosmodrome in Kazakhstan on July 14th at 6:36 UT, lofting its main payload, the Kanopus-V-IK, Russia's newest Earth-observing satellite. But Kanopus didn't launch alone. Hitching a ride to space were 72 smaller satellites (a record-breaking payload) headed for three separate orbits. Among them was Mayak (Russian for "beacon of light"), a CubeSat of particular interest to amateur astronomers and satellite spotters. Mayak is Russia's first crowdfunded satellite. Built around a standard 3U cubesat body measuring 34 x 10 x 10 cm, Mayak was designed by engineering students at Moscow Polytechnic University. The satellite will test an aerodynamic braking system that could de-orbit satellites without using an engine, and it comes equipped with reflectors to provide data on the satellite's visibility and distance. To that end, the satellite is set to deploy a large tetrahedron-shaped reflector. Each surface is four square meters on a side and should be readily visible from the ground on a twilight pass. In fact, the team claims, Mayak will be the “brightest shooting star” once unfurled, almost as bright as the full Moon at magnitude –10. Mayak could be visible in bright twilight and perhaps even during daytime passes as well. Roscosmos issued a brief statement Friday, noting that the launch was successful and listing the manifest of satellites to be deployed. U.S. Joint Space Operations Command backed up that claim and assigned Mayak a NORAD tracking ID of 2017-042F/42830. An artist's depiction of the Fregat upper stage dispensing cubesats into orbit. At this point, it isn't clear yet whether Mayak has successfully deployed its reflector or not. Your best bet is simply to go out and look. The team has a tracking app named CosmoMayak, though it's only offered in Russian. Worldwide sat-spotters may do better using Heavens-Above, which put up a dedicated section for Mayak on their homepage last night. Orbiting Earth once every 97 minutes in a 587 x 605 km orbit, Mayak is in a retrograde Sun-synchronous, 97°-inclination orbit, typical for Earth-observing satellites. Current passes this week favor latitudes 40°N to 50°N around midnight, optimal for North America, the UK, and northern European observers. The orbital trace of Mayak. The plan is to fly Mayak in a stabilized mode for the first four weeks, then set it tumbling on all three axes, setting off a brilliant twinkling pattern. The team's site mentions using brightness estimations from Mayak to gather information about air density at high altitude and to calibrate brightness estimations for future satellites. The reflector will also speed up reentry once deployed, utilizing both solar wind pressure and atmospheric drag. Such devices may become a standard feature on future satellites, enabling them to de-orbit shortly after their mission ends rather than adding to the growing tally of space junk in low-Earth orbit. Nanosail-D2 tested a similar technology in 2011, and another mission recently dispatched from the International Space Station, InflateSail, is currently testing the same method. Nanosail D2 over the Netherlands. If it's as bright as claimed, Mayak could surpass the brightness of the famed first generation of Iridium satellites, which routinely flare up to magnitude –8. Unfortunately, the second generation of Iridium satellites currently being deployed won't flare in the same fashion. Is Mayak a good idea? One brilliant (and short-lived) satellite could be a great way to get the public out and looking up at the night sky. A Japanese start-up named Star-ALE, for example, wants to create artificial meteor showers for customers starting in 2020. In fact, ideas for placing advertising in space date back to the 1980s, though thankfully, we do not have McDonald's or Pepsi logos drifting through the night sky just yet. True story: NASA and the U.S. Air Force actually studied the idea of using large reflectors placed in space to banish night during the Vietnam War, though this, too, never came to pass. Mayak unfurled in the lab. The few satellite hunters with clear skies last night that we've heard from have all reported negative results so far, suggesting that either Mayak's reflector has yet to deploy, or it was deployed unsuccessfully. If you've got clear skies, take a look tonight and let us know what you see. We'll drop in a brief update to this post when better magnitude estimates come in. Clear skies, and good luck on the satellite hunt!